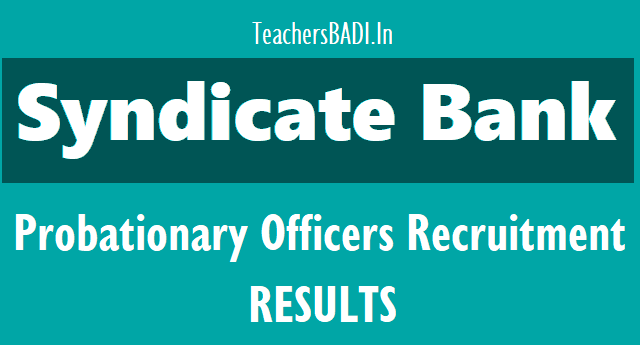 Syndicate Bank has declared the results of Probationary Officers (POs) recruitment through Post Graduate Diploma in Banking and Finance (PGDBF). The bank has conducted the online exam for PO recruitment on February 25, 2018. Next step in the Syndicate Bank PO recruitment process is Group Discussion and Personal Interview. Syndicate Bank had released the admit card for the PGDBF programme 2018 in February second week. Candidates who have appeared for the exam can now download their results at syndicatebank.in. Upon selection candidates will be enrolled in One year Post Graduate Diploma in Banking and Finance course in Manipal Global Education Services Pvt Ltd. (MaGE), Bangalore and Nitte Education International Pvt Ltd. (NEIPL) Greater Noida / Mangalore. Post course completion, within the stipulated time, candidates will be offered appointment in the bank as Probationary Officer in Junior Management Grade / Scale-I. A total of 500 seats are open for intake. Online registration was held in January 2018.